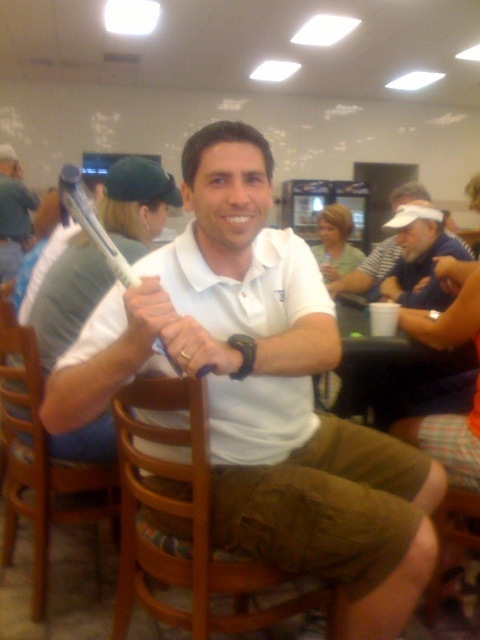 3 of the BTT cast are at a charity tornament in Dallas vying to win a WSOP entry. The TD tells us that Home Depot donated a $100 (!?) hammer for any player who takes one down with Dan’s favorite hand. As its announced, a guy to my left says “sounds like one of Dan’s ideas”. Turns out that Whit is a pokerati reader and made me from the player list. A few moments later, SnG raises a limped pot with 72o and is rewarded with two pair on the flop. Here’s a pic of SnG just before he asked if there was a receipt.